Click on the "Return to Search Result" button to go back to the search list screen. Words with different background color are the keywords used to search the article. 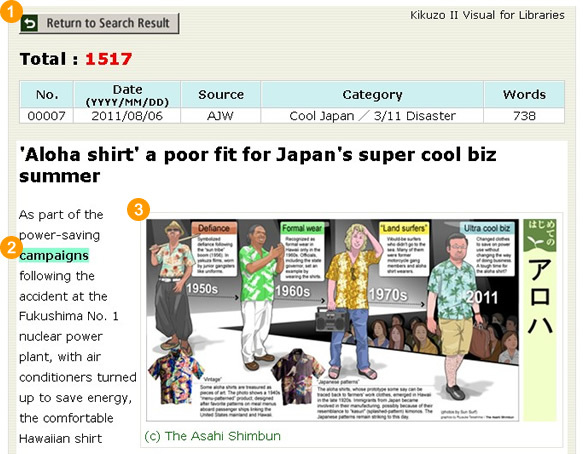 For articles published by AJW(2011.3〜）, the images are displayed when there are photos or graphics. ★Some AJW articles, such as "Vox Populi,Vox Dei"(天声人語), "Editorial" (社説), are available not only in English, but also in Japanese, Chinese and Korean. When you click on the link, such as the following, you could jump to the corresponding article.